Jan Andersson's impressive Scandinavian Pipemakers began, fittingly enough, with a suggestion from Tom Eltang, while they were both attending a summer evening party being held by Bo Nordh in his garden. 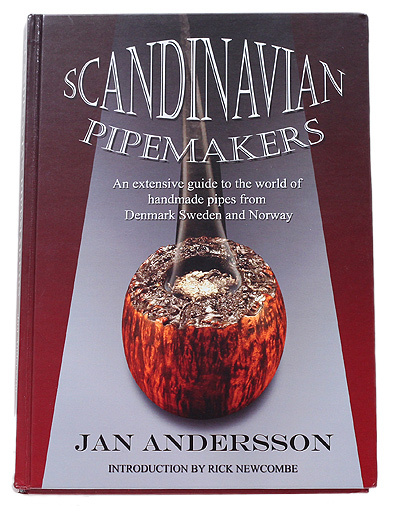 Andersson had expressed that he indeed wished to write such a comprehensive tome on the artisan pipemakers of Scandivia as Eltang was suggesting, and promised that he would begin working on it as soon as he retired. As fate would have it, however, Bo Nordh's passing closely preceded said retirement, and Andersson felt he must pay his respects by making the penning of Bo Nordh - pipemaker his first priority. Following its completion and publication, though, he immediately turned back to his work on this, his promised tome. That was in 2008. Now, four years of effort later, we are at last presented with this, the first edition of Scandinavian Pipemakers. In his friendly and enthusiastic tone Jan Andersson takes through the histories of dozens of the most influential artisan pipemakers from Denmark, Sweden, and Norway (including all three Ivarssons), as well as that of Stanwell (which simply worked with too many influential pipemakers to be left out) and the Larsen factory. Valuable to the experienced collector and the initiate alike, Scandinavian Pipemakers covers everything from classic shapes and their distinctness from the freehands popularized during the "fancy" era, to the personal anecdotes of those who've known the creators of some of the most prized and rarefied briars in the entire history of the pipe - and all with a wealth of full-color photographs throughout. Beautiful coffee table book, but even better encyclopedia. Great write-ups & lovely pictures of makers' examples.